Lalitha Gopalan’s introduction begins with a fine proposal: that the cinema proposes to us. This opening proposition to Gopalan’s lucid work on the cinema throws us head first into the heart of her elaborate argument. It was, for me, a very delightful proposition; one that made me instantly receptive to Gopalan’s emerging thesis. Gopalan argues that it is not just any cinema that proposes to us but most explicitly Indian popular cinema. Thus we begin immediately in Cinema of Interruptions to consider what this cinema specifically has to offer us. The film implies that Kamal loses because of his inability to participate in the correct triangulation – he loves only Mili, whereas Mili’s first love is the cinema. It is Muna and Mili’s love for cinema that dictates their love story, the preferred triangulation in the film (p. 2). This reading relocates the lines of the love triangle of the film away from Kamal and instead directs them towards cinema itself. Interestingly, rather than the love triangle between Kamal, Mili and Muna, which must be broken for the film to conclude in union, this new triangular formation – between two lovers of the cinema – holds up at the film’s resolution. 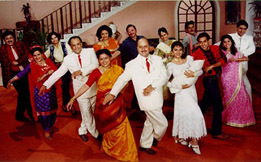 The opening credit sequence has both leads, Madhuri Dixit and Salman Khan, looking straight at us singing ‘Hum aapke hain koun?’/’Who am I to you?’; asking us to reflect on our relationship to cinema, the film draws us into a triangular economy of desire, making us an integral part of its love story (p. 3). This question – “Hum aapke hain koun?” – is absolutely central to Gopalan’s deployment of a myriad of interruptions performed by the action genres of contemporary Indian cinema. Not only does this question acknowledge the spectators amorous relationship to the screen (affirming Gopalan’s pivotal proposition that the cinema proposes to us), it exhibits – as Gopalan tells us “an ironic posture that, as critics, we are reluctant to accord to the commercial industry” (p. 3). Gopalan points out that this ironic commentary relies on our familiarity with the conventions of the action genres of Indian popular cinema, presupposing a long-term relationship with them. Acknowledging these preconditions, Hum Aapke Hain Koun..! prompts us to consider the nature of our viewing practices. “More often than not, by calling attention to our viewing habits within the diegesis and naming it love, contemporary Indian films have closed the gap between the screen and the spectator” (p. 3). Encouraged by the direct address of the “Hum aapke hain koun?” song and dance sequence, Gopalan suggests that in order to account for this closing of the gap between screen and spectator, we should read popular Indian films from the point of view of a cinephiliac. Thus Gopalan situates herself in the company of a fine body of writing on film theory and cinephilia (1), offering us a discussion of what cinephilia might mean in the Indian context. Gopalan implicates both the reader and herself by airing her love affairs, admitting that, like Muna and Mili, her first love is for the cinema. She stakes out a territory of pleasures, both interrupted and sustained, that enable her thesis to develop. Cinema of Interruptions charts a love affair with Indian popular cinema that recounts repeat viewing of familiar films and favours reading them by way of particular, perhaps peripheral (what she terms ornamental) details – a kind of cinephiliac’s fetishisation. It is Gopalan’s conspicuous interweaving of matters conceptual and personal that keeps both love and theory in sight of each other. Specifically referring to action genres in contemporary Indian cinema, by interruptions Gopalan principally means the intermission that occurs 80 minutes into a film, the song and dance sequences and censorship regulations. While these are the three primary manifestations of interruption in Indian popular cinema, they are also simply the most immediately apparent, explicit manifestations we encounter. Gopalan articulates a much more diverse range of subtle possibilities, hinting at some, coming to rest at others, while allowing a number to brush up against one another. This approach leads her to formulate the term constellation of interruptions to account for an articulate and nuanced range of disruptions that texture the transference between spectator, screen and cinematic duration. Such a term aptly encompasses interruptive forces including irony, flashbacks and “auteur signatures” (p. 19). This constellation of interruptions textures the book itself so that its chapters are divided not according to the various manifestations of this constellation but in accordance with Gopalan’s choice of films, directors and genres. As Gopalan tells us, “cinephilia colours the selection of genre films in this book” (p. 3). The second chapter deals with the “Avenging Women” genre and its relationship to censorship regulations. This is followed in the third with a focus on J.P. Dutta’s films and their restructuring of narrative and anticipation in gangster films. The forth chapter on Mani Ratnam’s Nayakan accounts for “auteur signatures” that operate interruptive reconfigurations of genre. The final chapter discusses Vidhu Vinod Chopra’s Parinda and its use of flashbacks. I found that censorship was fascinatingly dealt with in Cinema of Interruptions, since by censorship, Gopalan does not only mean that a film carries with it traces of censored cuts. The book acknowledges a spectrum of negotiations around censorship regulations, manifesting most blatantly on the female body. This is specifically dealt with in the second chapter, “Avenging Women in Indian Cinema” (2). Gopalan’s negotiation of censorship culminates in the technique she whimsically labels coitus interruptus – “the camera withdraws just before a steamy love scene ensues, and the film replaces it with extra-diegetic shots of waterfalls, flowers, thunder, lightning, and tropical storms” (p. 21). Otherwise identified, with equal humour, as the withdrawal-of-the-camera method, Gopalan signals it as producing, ironically, a crucial source of “surplus pleasure” unintended by the censor, affirming one of Gopalan’s central premises – that in Indian cinema we find pleasure in these interruptions and not despite them. Describing cinephilia variously as resistance, complicity, necrophilia, and excess, Willemen prescribes it as an antidote to the usual theoretical practice of subsuming, even smothering, films under a formal theoretical edifice (p. 13). This is Gopalan’s reading strategy; to account for Indian cinema without subsuming it to an existing theoretical paradigm and instead challenging theory to correspond to the experience of watching it – to enable the films themselves to lead the way. In spite of film studies’ self-representation as a marginal field, there is no doubt that the dominant American imaginary, where its own interests are at the centre, influences my colleagues who find difference in international cinema a difficult idea to come to terms with. All too often as students of Indian cinema, we spend too much time imparting basic information to an audience whose standard question begins: ‘Although I have not seen an Indian film…’ (p. 15). Gopalan’s approach attempts to puncture the myopia she has encountered in her own film community in order to account for the experiences specific to contemporary Indian popular cinema. The fragmentary narrative cited as a unique feature of ‘New Hollywood’ has long been a cinematic style in Indian popular cinema, which invented the ‘multi-starrer’, a concept that Justin Wyatt identifies as the ‘high concept’ of the post-studio era in America (p. 27). Gopalan is keen to rewire the circuits of a virtual global economy that announce the US dominance in the global marketplace. She positions Indian commercial cinema at a particularly productive intersection of local and global cinema practices. Gopalan’s emphasis on pleasure and celebration of these closely scrutinised interruptions as a starting point for making meaning, performs an important critical manoeuvre, enabling the focus to shift towards the strength of Indian cinematic conventions rather than “mulling over how these films are derived from Hollywood genres” (p. 18). It is Gopalan’s timing, reading as she does by way of interruption, which enables this shift in emphasis, performing a postcolonial critique (4). As Gopalan points out, this emphasis works “against the perceived naturalised, internally coherent form of the American studio genres, underscoring the national characteristics of both kinds of cinemas” (p. 181). At a more literal level, we can see that Indian cinema does actually interrupt the Hollywood universe and its action genres (Gopalan focuses on gangsters and westerns) characterised, as they are, by continuity editing, omniscient narration, an internally coherent diegesis and character motivated plots. In contrast to the Hollywood universe, we have an Indian western or gangster film – Gopalan discuses at length, Sholay (1975), Nayakan (1987) and Parinda (1989) – with extra diegetic sequences, sequences of attractions, elaborate digressions, an intermission, multiple narratives and frontal address. This gives these globally circulating genres an entirely different set of rhythmic inflections that literally cracks open the Hollywood universe. 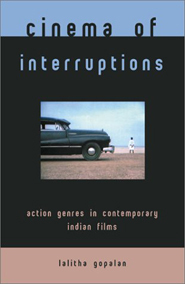 Gopalan’s wide articulation of these interruptions also includes the ways in which certain directors, particularly Mani Ratnam and Vidhu Vinod Chopra, have reconfigured conventional interruptions, such as song and dance sequences, into an integrated mode, propelling the narrative in crucial ways. Parthepan’s Tamil film Housefull (1999) is cited for providing its own commentary on the role of the intermission. During a film watched by the characters within Housefull, a bomb threat prompts police to request intermission be delayed. This results in the projectionist reorganising the film reels, affirming for us that interruptions are not purely disruptive but perform at intersections that forge correspondences. The focus upon rhythmic re-inflection of particular action genres in Cinema of Interruptions regularly prompted me to ask – what kind of duration does the book itself have? This question arose not only because of the concepts with which Gopalan operates but the way in which they were manipulated. Gopalan keeps her complex agenda steadfastly afloat and under impressive intellectual control, allowing a generous seepage between her primary concerns. One can sense undercurrents within her argument, reflecting Indian cinema’s “indirectness, in-between-ness, its propensity for digression and interruption” (p. 28). Concepts graze past one another, at times bumping into one another with exciting results. Something about this approach and Gopalan’s writing style make me want to describe Cinema of Interruptions as oceanic. Reading this book, I felt at times as if I was falling into her narration, letting its currents wash over me. I never felt drowned or disorientated by this experience but as if I knew all the while that stable ground was always within reach. At other times I felt as if I was bobbing up and down on a floatation device, on the ebb and flow of her emerging argument, happy to be carried away by rips or ride a wave into shore. It seems appropriate given this oceanic experience, for me to draw some parallels between myself as a spectator of this book and the spectators of this cinema it describes. Gopalan’s writing strategies seem to emulate her subject to the degree that her own term – constellation of interruptions – seems an apt description for the intricate pattern of her own rich argument. For me this fact is pertinent in assessing why Gopalan succeeds so well in Cinema of Interruptions as a critic and theorist. Certainly, this is not a book that enthusiastically smothers its object – not a book of the all-knowing critic – but one whose cues come from the rhythms of the films themselves, following the impulses of the author (5). This kind of approach to writing about the cinema activates, for its reader, the films about which it is concerned. Gopalan has succeeded in engaging her senses – and therefore her pleasures – before recruiting the conceptual tools necessary to account what she has experienced. This method of coming to terms with the cinema has a very different duration to the more pre-programmed, automated critical response of which Gopalan is critical. By a different duration I mean that Gopalan’s writing is digressive, sinuous and responsive to what she has apprehended rather than following the linear trajectory of a preconceived argument. Her writing interrupts itself. And in this, I took great pleasure. In particular, Gopalan frames Paul Willemen’s accounts of cinephilia within her introduction, quoting him at length on pp. 11-13. She situates these comments with reference to Susan Sontag’s essay lamenting the death of cinema, film journals Vertigo and Cahiers du cinéma, Jonathan Rosenbaum’s letters published in Film Quarterly, as well as writings by Peter Wollen, Christine Keathley, Sharon Willis and Richard Dyer. Gopalan’s original discussion of this subject can be found in “Coitus Interruptus and Love Story in Indian Cinema”, in Vidya Dehejia (ed. ), Representing the Body: Gender Issues in Indian Art, (New Delhi: Kali for Women, 1997). Paul Willemen, “Through the Glass Darkly: Cinephilia Reconsidered” in Looks and Frictions: Essays in Cultural Studies and Film Theory, (Bloomington: Indiana University Press, 1994). Gopalan quotes at length from Willemen’s definitions of cinephilia in this book. Homi Bhabha’s fashioning of narrative time and nationhood in The Location of Culture, cited by Gopalan, provides a useful model for articulating how such a reading of this cinema itself can interrupt Hollywood’s ambitions for global dominance. Homi Bhabha, “DissemiNation: Time, Narrative and the Margins of the Modern Nation”, The Location of Culture, (London & NY: Routledge, 1994). Gopalan uses this particular essay to support her reading of Mani Ratnam’s Nayakan and its use of flashbacks and non-linear time structures. What results is a form of criticism that Laleen Jayamanne has termed mimetic doubling of the filmic object. See Laleen Jayamanne’s excellent introduction, entitled “Criticism as ‘Exact Fantasy’” in Towards Cinema and Its Double: Cross-Cultural Mimesis, (Bloomington Indiana University Press, 2001), for a discussion of the necessity of this kind of film criticism.